Halewood colleague and Karate champion Cameron Graham is busy taking on the world as part of an all-conquering England team. And in September Cameron and his teammates landed the biggest title of them all when England won the World Team Championship in Italy. When 22-year old Cameron Graham helped England lift the world Shotokan Karate title in Italy this September he dropped to the floor and screamed with delight and then admits that for quite a while afterwards he was completely lost for words. Winning a world title for your country is always likely to be an overwhelming experience however Cameron’s reaction reflected the fact that this victory had been 15 long, hard years in the making. Thousands of gruelling training and sparring sessions have been completed, hundreds of long trips to tournaments undertaken, and along the way Cameron has received numerous lumps and bumps in an exceptionally physical contact sport. Breaking his elbow sounds like the most painful injury but there have been plenty of others! Cameron has an incredible supply of willpower and the ability to completely focus and ‘find a way to win’ when he competes for his country. When it comes to determination and a desire for hard work he leaves nothing in the tank. In the build-up to the world championships he trained six times a week and these two hour sessions involved a range of fitness and technical workouts as well as some fierce sparring. This took huge commitment because Cameron was working full-time at Halewood on engine dress and had either completed a shift or was about to start one. It is also worth noting that Cameron’s sport is non-professional and because it does not feature at the Olympics either he is effectively training like a full-time athlete but with little or no funding. What Cameron achieves is entirely down to him and the dedication of his small team which includes his long-term coach as well as his Dad Kenneth who also works at Halewood. 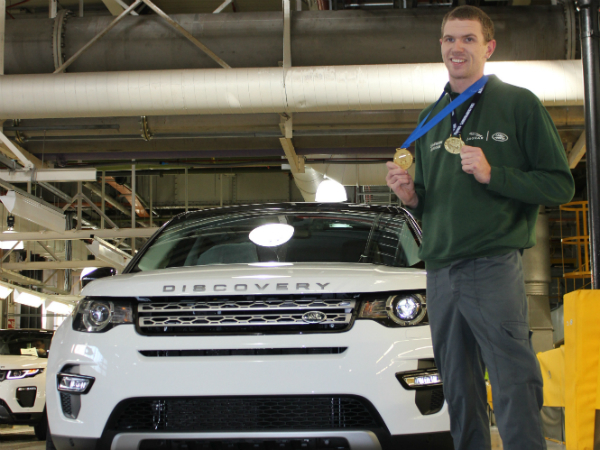 Cameron said that his Jaguar Land Rover colleagues gave him a great reception when he returned to work as a world champion, although buying the team doughnuts to celebrate his success proved to be a popular move! Representing his country, seeing off the challenge of some very hard competitors and travelling all over Europe for international tournaments has also helped Cameron at work. As he explains, if you are confident enough not to blink when faced by a huge Russian Karate expert or can keep your focus in front of thousands of spectators it puts any issues you face during your working day into perspective. A true champion, we're happy to celebrate #InternationalNinjaDay with you Cameron!